Thanks to the NFB Newsline for The Blind telephone service I rely upon for Daily Newspapers across thou nation read to me. The service also allows access to a slew of Magazines, for which one of these I look forward to monthly is the Air and Space Magazine. Thus, whilst perusing the February, 2018 issue, I came across a most interesting article about the first Black Americans to fly across our Nation, No less than during the Great Depression! Naturally, like much History, I was totally unaware of this epic Transcontinental Flight and it's Trail Blazing Pioneers known as "the Flying Hobos!" As I'm guessing that most of Yuhs have never heard of James Herman Banning or Thomas Cox Allen, Righto? And what caught my Attenzione in the article was noting how Philip Hart, Banning's Great Nephew mentioning how as a Junior in High School, and trying to learn more about his ancestor, he mused during his library visits why can't I read about my Great Uncle! But naturally, in our jaundiced "fair and Balanced" Media, Nary A Peep has been mentioned over these most determined pioneers, who set out upon their 3,300 mile flight with just $25.00 in hand, enough to cover the cost of their flight's first leg from Los Angeles to Yuma, Arizona. As Messer's Banning & Allen's exploits came frothing Onshore My Collective Yoke once again, when Ironically whilst listening to a most different type Genre 'O CD Audiobook for Mwah, yet being recommended by one of our very helpful Florence librarians. She suggested a book titled New York 2140.
somewheres' towards the beginning of Disc 2, the studious Announcer voice that interlaces Odd Factoids between the narrative mused over The Black Eagle, aka Hubert Fauntleroy Julian, being the first Black Licensed Pilot in America in 1924, who subsequently challenged Herman Goering to a Dual! And if that 'lil "Factoid" wasn't enough to make Y'all curious, Messer Julian. A.K.A. The Black Eagle was a most colourful character, who in his latter life became a "Dubious" Arms Dealer, ultimately ensnared in his Shady transactions by our nation's "Federalis'. Yet like many a story that I read; Err listen to. As My Gal', nee Lucy', My ARSE-Steamed' Screen Reader, who "double Dips" by also reading me my Daily News; But I digress. Thars' typically some more hidden nuggets in thou article. Such was the case whilst listening about The Black Eagle, who apparently was at loggerheads with another Black American Volunteer of Ethiopia's Air Force during the 1930's. As his name was John Charles Robinson, who became known as The Brown Condor. Upon cursory searching for more information upon this unknown Black Flyboy' to Mwah, I was unable to unearth much upon him, albeit marveling over the fact that a thirty year old Los Angeles Times article interviewing the author of the definitive book upon him was still accessible via Zed Internetz'. Yet arguably, Mr. Robinson is the most important Aeroplane pilot of these Blokes', since after graduating from the Tuskegee Institute of Alabama, he became the first ever African American to gain admission into the then very prestigious Curtis Wright Aeronautical School, after initially being Denied multiple times. 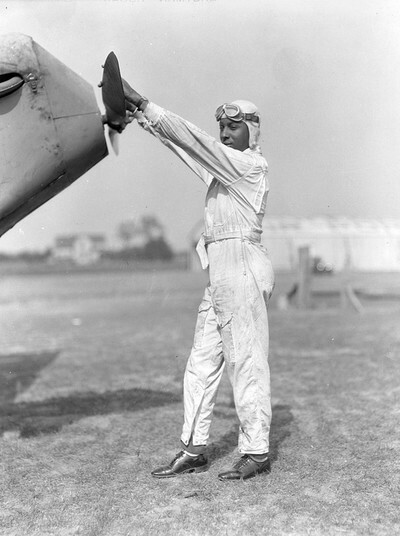 After graduating from Curtis Wright's Aviation School, Robinson subsequently returned to his previous Alma Mater, Tuskegee Institute in hopes of getting the school to begin an aviation programme, specifically to promote African Americans abilities, which ultimately led to the Tuskegee airmen of World War II in their now famous Red Tails P-51 Mustangs. Following Ethiopia's Liberation by the Allies in 1941, Robinson returned later with the U.S. army Air force, for which he was not only instrumental in re-establishing Ethiopia's Imperial air Force. But also in what ultimately would become Ethiopia Airlines, which began flying passengers commercially in April, 1946, before he was killed in an Airplane accident in 1954. As I cannot help wondering whether Robinson, a la Mr. Julian who were both honing their pilot skills upon the East Coast during the same time-frame as the aforementioned Messer's Banning & Allen were on the West Coast, if somehow their paths didn't cross briefly? Especially since Chicago was the epicenter for Black Pilots during the early 1930's.